I had a cold after my trip to Indiana. It was perfectly timed with my attempt to get back up on the horse for 2012. An early start couldn’t hurt. But I knew better than to go outside in these cold and wet conditions. So I went downstairs, dusted off the treadmill, and booted up Netflix. Its been nearly a year since I have been on the treadmill so there should be a bunch of stuff to catch up on that I can watch to keep me busy. I was just keeping it to myself but I am sort of rebuilding some motivation and confidence watching a few movies and I thought I would share. Dean. I hadn’t seen this movie but was loosely apart of the adventure back in 2006 (fun old post to read) when I met him in Boulder. 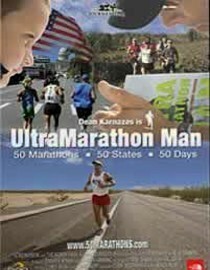 Before I knew what an “ultra” was, I was searching for something bigger and found Dean’s book. Read it like everybody else and was hooked on the idea. But Dean is the “gateway drug” of ultramarathons. You use him to get started and become addicted but soon you are off looking for truer forms. However, while we all bash Dean from time to time, its probably a bit out of envy. The guy figured out how to parlay this thing we do into a living and motivate people 100x over what any of do through our own running and writing. The movie was really about the journey though the 50 states and the ups and downs of the races. The logistics. The crew. The family support. Getting kids off the couch. Then finishing up in the NYC marathon where Dean was just one more runner somewhere in the sea of people. The afterward trying to run back home across the USA to re-fuel himself…through running. Its a weird thing watching a movie about running while running. Kind of emotional at time when people told their individual stories about cancer, losing a limb, dropping weight, or whatever. Then they just get out there and start running to regain some control, find some freedom, and just clear away the clutter for a while. That stuff get me every time. So while in a bit of limbo myself these days, I found some inspiration once again back in a place that I started from. Thanks, Dean.